During the night we are woken by very loud claps of overhead thunder and we get up to see wet roads and rain out of the window. By the time we have had breakfast and leave, the rain has stopped and the day has just become cool and damp, which may suit us because we have a fairly long cross country journey today, which could be quite choppy. We are given the garage door zapper so that we can retrieve the trike and Sheila is instructed in its use. At the garage, however, we run into TP6. Sheila is not sure where to aim it and we can’t persuade the huge automatic doors to open. John tries pointing it in the opposite direction and waving it at all parts of the doors and they open. The garage is a vast cavernous affair going right through the block to the street beyond and we notice the rear doors are open. Then we realise that we have probably opened the rear doors by mistake with our initial zapper efforts. A few more efforts at button pushing and we manage to close these doors without also simultaneously closing the front doors and leaving us imprisoned in a dark garage for the day. We retrieve the trike and successfully close the front doors, feeling quite exhausted – this is even trickier than our television and digital box at home, which requires two-handed double zapper dexterity for some operations. The only remaining problem is that we are in a narrow one-way street going the wrong way, so John solos the trike around the block via the railway station while Sheila walks back to the hotel, on the way collecting sandwiches from the boulangerie where we ordered them last night. 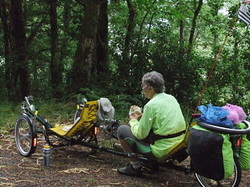 Loaded up and with pertex tops on we depart along the Aveyron gorge, which is quite atmospheric in the misty morning. After an easy start we turn and begin some serious climbing to take us out of the gorge onto the high land above. It is tough going along this arrowed road and we make slow progress for the next 12km to the road junction with the D911. The low cloud has meant that we have not had much in the way of views and we are now very high in thick cloud fog. We have a decision to take. We can either continue to La Salvetat Peyralès along a tiny unclassified road littered with arrows on the map, or take a 4km detour along a main road to Rieupeyroux to reach the D905 that is likely to be a better quality and grade of road. We opt for the latter and put our bright rear lights on using both rows of LEDs in multiple flashing sequences. We pound along the wide and smooth road as fast as we can. There is a good grass margin to the road and John’s eyes are glued to the rear view mirrors prepared to take to this if any vehicle appears out of the fog without its left-hand indicators flashing to clearly show we have been seen and are being overtaken safely. The D905 road lives up to expectations. It has a good surface, very little traffic and is steadily downhill all the way. We stay in the big ring we used on the main road, select our smallest sprocket and effortlessly spin along at 40 to 50kph for the next 12km. Slightly chilled from the fast descent we are pleased to see that La Salvetat Peyralès has a café. We pull up and go in. No one appears to be in residence, but after a bit of calling out the elderly patron appears. “Two hot chocolates please”. He is happy for us to eat our PaRs at the same time and when we have finished we order, “two more hot chocolates please”. Another local arrives at the café. We explain that we are going to Villefranche de Panat via Naucelle. They look knowingly at each other but make no comment and when we leave at first they watch from behind the curtain, but when Sheila waves they come out and see us off from the doorstep. The road is small and has a fairly indifferent surface. It twists and turns and goes down and down steeply and then climbs just as steeply. This is followed by another steep downhill and because of the road conditions we can only go fairly slowly with lots of braking. We can’t believe the road can go down for so long, we must be near the centre of the earth? Wrong, round the corner and we plummet through the trees to the far depths of a ravine. Only one thing can follow and it does, we claw our way up the other side of the ravine in bottom gear with a 10% (and some steeper bits) slope putting us just about at the limit of our fully loaded climbing ability. John stops looking at the cycle computer because at 5kph it takes an eternity just to too tick round the next 100m. At least it is damp and cool. Finally we crest the summit. The mist is not so intense and while we can’t see forever, we have a view of high green countryside and trees. It looks quite benign, but because we are looking across the grain of the country, it is not apparent that it is riven by huge ravines. A short lumpy spell and we repeat the whole performance, disappearing into a seemingly bottomless ravine only to have to grind our way for 6km out of it on the other side. Halfway up we decide that it is time for lunch and pull to the roadside with the tree covered ground falling almost vertically away beside us. Out of the ravine there is lumpier cycling to the road junction at La Selve and another route decision. Our intended route continues on very small roads, probably over very similar terrain. The alternative is to take a slightly bigger D road via Réquista. This is quite a lot longer and the map shows that this road is also littered with arrows, but it should have a better surface and we might at least make better progress downhill. We opt for the longer detour. Good road surface but within 300km we meet a succession of hairpin bends and begin a long steep climb. Was this such a good idea? – not knowing the alternative there is no answer, but this is certainly not an easy option. In 4km we are rewarded with a downhill spell on which we can let the trike run, but all to soon this is replaced by a steep climb that continues for the next 8km to Réquista. Réquista has a café so we stop for much needed coffees. Outside we do some re-fuelling at the roadside from apricots and ‘Figous’. A passerby says he is a cyclist and would like to photograph the trike for a friend who has a recumbent, will we wait for him to go home (just around the corner) for his camera? We say we will be here for the next 10 minutes. John deals with a few ATQs while Sheila goes on a chocolate quest. We are ready to go and our would-be photographer has not returned so we set off. As we do he re-appears on his bike so we are able to pause and let him get an action photo of us on the trike. The road onwards is hardly flat, but nothing like as severe as our earlier journey, so we are happy to make steady progress. Sheila phones the hotel to let them have a revised estimated arrival time. The final stretch to V de P is again a fairly steep hill requiring a steady effort. We can see the town church high above us, but this turns out to be la Besse, which merges with V de P and we swing round and are rewarded with a final downhill freewheel to reach Villefranche de Panat on the river Alrance. The town is very small so finding our hotel is easy. It is locked up shut. Sheila phones but gets no reply. The trike is wet and while we sit and wait, Sheila manages to borrow an aerosol can with an unknown motorcycle lubricant in it from the garage next door. All the writing on the can is in German. We try a bit on a tissue and as it looks to be a reasonably light lubricant we give both chains a dose to disperse the water on them. Eventually Madame arrives and opens up. We park the trike in the garage to a house a few doors away. We are told where our room is and are sent up via a sliding door across the stairs with a strange locking system that can only be used from below. We are told to close the door behind us. The hotel is pretty basic, but our room is en suite, albeit with only two sheets of toilet paper and one small towel. There is also a television, but no reception. The shower produces hot water so not all bad. Sheila goes down on a towel quest and re-appears with a second small towel, but we never manage to receive a further supply of toilet paper. Showers and chocolate; and we hang up our damp clothes to dry. The hotel is the only show in town so we are eating in. At the bar for a drink we have the distinct impression we are regarded as more of a nuisance than valued customers. The local workmen all troop outside for their fags and we are sure that if we had not been there this would not happen. Madame seems to regard the smoking rules as not applying to her in her hotel anyway. Dinner is fairly indifferent and certainly poor value for money. Noticeably, we don’t even get offered the cheese served to the other four workmen who are staying in the hotel. We ascertain that breakfast is at 7:30 am, have a short walk around town (it is a very small town) to check the shopping opportunities for tomorrow, and retire to bed.